We believe every customer, no matter the size or cloud infrastructure design, deserves to Hear from a Human whenever they need assistance. 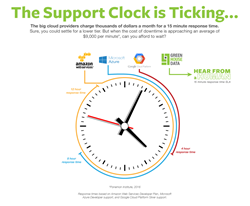 Green House Data, a nationwide provider of cloud hosting, colocation, and managed services, today announced its new Hear from a Human complimentary support plan, with round-the-clock customer service for every cloud computing customer including a 15 minute response Service Level Agreement. While public and hybrid clouds from Infrastructure as a Service providers have traditionally come with a significant monthly price tag for basic support services, Green House Data’s gBlock® Cloud offers each customer access to expert technicians for 24/7/365 phone, web portal, or e-mail contact options. “We believe every customer, no matter the size or cloud infrastructure design, deserves to Hear from a Human whenever they need assistance,” said Shawn Mills, CEO of Green House Data. Amazon Web Services and Microsoft Azure are the two largest cloud hosting providers in the world, and both offer paid tiers. In either case, customers are charged a minimum $1,000 monthly fee to receive a one-hour response time for critical issues. In contrast, Green House Data staff responds to phone inquiries immediately and web inquiries in 15 minutes as a matter of course. Clients who purchase additional operating system licensing, applications, or managed services from Green House Data can also take advantage of problem resolution up to and including the application stack. “When your IT systems are down or having trouble, your business is suffering. Green House Data customers know they can always pick up the phone and reach a real person who is ready to help get their cloud infrastructure back online,” said Mills.